Provincial elections scheduled for April 20 have been postponed in Anbar and Ninewa provinces. Prime Minister Nouri al-Maliki achieved the delay through the Council of Ministers after provincial politicians claimed security was a critical concern. The move enhances the provincial campaigns of Maliki and his allies and directly limits key Sunni rivals, such as Osama al-Nujaifi and Rafi al-Issawi, whose support derives from these provinces. Meanwhile, Muqtada al-Sadr used the decision to his own political advantage by emphasizing Maliki’s inability to provide security and leading his bloc to boycott the Cabinet as a result. 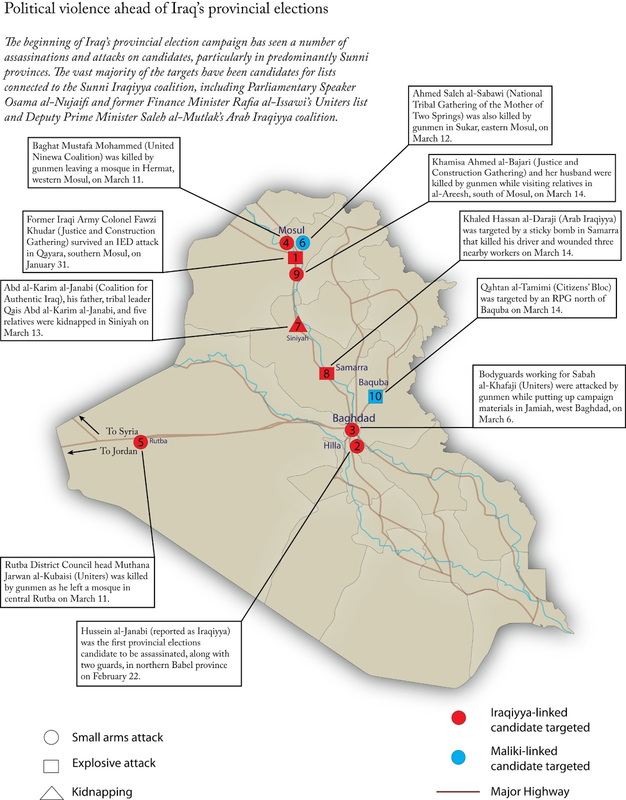 The next four weeks of electoral campaigns will likely concentrate upon Sunni rivalries in Salah ad-Din and Diyala as well as intra-Shi'a rivalries in southern Iraq. On March 19, the Iraqi Council of Ministers, headed by Prime Minister Nouri al-Maliki, announcedthat the provincial elections in Anbar and Ninewa will be postponed for a maximum of 6 months. The council attributed the decision to the security situation in both provinces and the need to prevent “terrorists from reaching to the provincial councils.” Mohsen al-Musawi, spokesperson for the Independent High Electoral Commission (IHEC), indicated that IHEC did not have “prior notification” of the decision and only heard about it when it was announced, insisting that IHEC was ready to hold elections in all provinces. The Council of Ministers took into account the decision on March 11 by the Anbar Provincial Council to postpone the elections and an expressed concern by some parties and personalities in Ninewa that the security environment is not conducive for campaigning. The provincial vote was surprising, given reportsthat, of the 21 Anbar Provincial Council members present, 19 voted to postpone. The only politician whose interests are apparently enhanced by this delay is Mutlak, whose relationship with the Sunni in Anbar has declined over the course of the protest movement; however, Mutlak’s affiliates do not have a majority on the council. The Iraqi Islamic Party is eager for elections to occur as soon as possible, as is Ahmad abu Risha, the former head of the al Sahwa movement. The lack of transparency on the vote makes it difficult to discern why the shift occurred. Reportedly, the Ninewa-based “Loyalty to Ninewa” bloc also requested that the elections be delayed. The bloc is headed by former Ninewa governor Ghanim al-Baso, who was in office between 2003 and 2004. While it is possible that this bloc and others in Ninewa similarly stand to gain politically by postponing elections, it is also worthwhile to note that AQI is most active in Ninewa, to the degree that IHEC acknowledged that elections preparations were facing particular difficulties there. As of March 23, 14 candidateshave withdrawn from Ninewa elections because of threats from AQI, and a number of poll workers have also withdrawn. It is therefore possible that the security threat in Ninewa is a more genuine impediment to elections. Nevertheless, Ninewa Governor Atheel al-Nujaifi considered the decision a “punishment” against anti-government protesters who have been demonstrating since December 2012 and indicated concerns about the legal status of the councils after their term is finished by April. Similarly, the Iraqi Kurds rejected the decision and condemned the cabinet for voting to postpone the elections despite the absence of the Iraqi Kurds and representatives of the Sunni Iraqiyya coalition at the session. The postponement was also met by angry reactions from Iraqi Shi’a parties. Islamic Supreme Council of Iraq (ISCI) leader Ammar al-Hakim describedthe decision as a “dangerous and very worrying step” and expressed concern that it might set a precedent for postponing the elections in other provinces. Generally, critics of the decision characterized it as a political decision rather than a security precaution. Given the securityatmosphere and requests by local governments and politicians to postpone the elections, Maliki appears to feel that he had solid political cover to postpone the elections, despite the fact that that elections were held in Anbar and Ninewa in 2005 in the face of crippling security conditions. Regardless, this is an opportune moment for Maliki to achieve a number of objectives. First, Maliki needs to outmaneuver the protesters and their organizers, who can mobilize in support of Maliki’s opponents in Anbar and Ninewa. Parliamentary Speaker Osama al-Nujaifi, strong in Ninewa, and former Finance Minister Rafia al-Issawi, strong in Anbar, are employing the protests to rally their bases, and as venues for electoral campaigning. Holding the elections in April will only help them gain votes and increase their influence. Second, Maliki needs to exhaust his political opponents and deprive them of ready access to voters. Key Sunni politicians, such as al-Nujaifi and Issawi, who would be best positioned in April to consolidate their efforts upon Salah ad Din and Diyala provinces. The decision also means that Maliki can focus on campaigning while undermining his opponents’ abilities to do the same. Third, postponing the elections will benefit Maliki’s political allies in Anbar and Ninewa, such as Mutlak, who are direct competitors to the opponents mentioned above. A delay in the elections will give them the chance to organize and recruit. Maliki’s decision is a warning about the health of Iraq’s political system. By all accounts, Maliki took the decision unilaterally without consulting IHEC, the Iraqi parliament, or other political blocs. The postponement again raises questions about Maliki’s reach within the Iraqi state and his willingness to use any tools to target opponents. The Sadrist Trend announced on March 19 that its ministers would boycott cabinet sessions. The announcement came after a week of intensifying Sadrist criticism of Prime Minister Nouri al-Maliki that focused on Maliki’s failure to provide services and security – key themes in the Sadrists’ attempts to fashion a populist image. The threat of a boycott suggests an attempt to disassociate the Sadrists from the failures of the Maliki government, an important task given the Sadrists’ hold on a number of service ministries and their consistent, if reluctant support for Maliki since the 2010 elections. At the same time, given Maliki’s willingness to buy Sadrist support through provincial governorships, ministerial appointments, and dealsover the control of independent institutions, it is possible that the Sadrists are using the boycott tactic in order to gain further concessions from the prime minister. Muqtada al-Sadr began 2013 with moves intended to pressure the premier, voting to limit Maliki’s term as prime minister and threatening to boycott cabinet meetings in protest at the government’s failure to meet the demands of anti-government protesters. The Sadrists were brought on board, however, by an offer to take overthe Finance Ministry from Iraqiyya and a dealover control of the Accountability and Justice Commission. The Sadrists also used the issue of the budget to presentthemselves as populists concerned primarily with Maliki’s failure to provide services and employment, while providing essential support to Maliki in votingfor the budget itself. On March 15, Sadrist spokesman Salah al-Obaidi criticized Maliki for refusing to meet with Sadr at the latter’s house in Najaf. The next day, the Sadrist Trend organizedits second annual “Day of the Oppressed” mass rally in the city of Kut on March 16. Hundreds of thousands, reportedly including Arab League envoy Naji Shalgham, listened to a televised statement from Muqtada al-Sadr in which the cleric lamented “injustice emanating from tyrannical rulers,” an implicit condemnation of Maliki. Muqtada al-Sadr heightened the criticism on March 19, issuing a statementcalling Maliki’s government “a subsidy to sin” and insisting that Sadrist involvement with it would be “harmful.” Sadr then roundly criticizedMaliki’s government, accusing the premier of “selling” Iraqi land to Kuwait, allowing al-Qaeda to reappear in Iraq, failing to install a replacement for absent Iraqi President Jalal Talabani, weakening Iraq’s parliament, and politicizing the judiciary. Sadr also stressedhis rejection of “the injustice incurred upon the Sunni sect.” The latter comment marks the first time in some weeks that Sadr has expressed support or sympathy for Sunni anti-government protesters and a departure from his movement’s support of hardline de-Baathification, which has primarily affected Sunni Arabs. This further emphasizes the expansive nature of Sadr’s criticism of Maliki. Later the same day, Sadr’s movement announcedthat Sadrist ministers would boycott cabinet meetings with immediate effect. Planning Minister and acting Finance Minister Ali al-Shukri stated at a press conference that the decision had been made at the headquarters of the Sadrist Trend’s political office in Baghdad, where the ministers had based their consultations with one another on Sadr’s earlier statements. Although no reason was given initially for the boycott, on March 20 Sadrist MP Jawad al-Shahila tied the boycott to the security situation, insisting that the boycott would continue unless security leaders – including Maliki, as Commander-in-Chief of the Armed Forces, as well as the defense and interior ministers and national security and intelligence chiefs – were held accountable for allowing recent attacks to take place. Maliki’s reaction to the Sadrist declaration has been to givethe Sadrists until Sunday, March 24, to clarify their intentions. Maliki’s media adviser Ali al-Moussawi stated the same day that Sadrist ministers would not be treated differently from other boycotting ministers and would not be allowed to run their ministries without attending cabinet meetings. This implicit threat followed the more explicit suggestion by State of Law MP Ihsan al-Awadi that Maliki might follow the precedent he set in countering the Iraqiyya boycott, placing absentee ministers on ‘compulsory leave’ and installing acting ministers in their place. This would further empower Maliki, either by granting him more allies at the cabinet table or by allowing him to buy support from other political blocs through ministerial appointments. It was reported on March 21, moreover, that the Sadrists had joined with Iraqiyya to request that Maliki answer questions in parliament about the security situation in Iraq and that Parliamentary Speaker Osama al-Nujaifi had agreed to the request. Sadrist spokesman Salah al-Obaidi subsequently announcedthat Sadr had met with Deputy Prime Minister Saleh al-Mutlak and senior Iraqiyya figures Jamal al-Karbouli and Haider al-Mulla. Mutlak and Karbouli have formed their own coalition for the provincial elections, Arab Iraqiyya, and they have long been the figures within Iraqiyya most amenable to working with Maliki. Meeting with these figures, rather than more consistent Maliki critics among the Sunni Arab leadership, suggests that Sadr was seeking to demonstrate some willingness to consult outside the Shi‘a National Alliance without harming his image by reaching out to Nujaifi and Issawi. It remains extremely unlikely that the Sadrists will form a united opposition front with Iraqiyya and the Kurds against Maliki, as Iraqiyya MP Wahida al-Jumaili suggested on March 20. Sadr has used the boycott gambit on a number of occasions in the past: Sadrist ministers refused to attend cabinet and parliamentary sessions for two months in late 2006, protesting a planned meeting between Maliki and President Bush; Sadr warned of his intention to boycott provincial elections originally scheduled for 2008 over the continued presence of American troops in Iraq; and a boycott was threatenedagain during the 2010 government formation process when Maliki announced plans to take control of the security ministries on an acting basis. More recently, Sadr calledhis ministers to Najaf in early February to discuss withdrawing from the government if the demands of anti-government protesters were not met. In that case, not only did Sadr fail to follow through on his rhetoric: he willingly took over the Finance Ministry from the boycotting Rafia al-Issawi, despite Bahaa al-Araji’s public insistencethat Sadrists would not occupy the posts of boycotting ministers. In the meantime, however, the absence of Sadrist ministers from cabinet sessions, alongside those Iraqiyya and Kurdish ministers that continue to boycott meetings, would limit Maliki’s ability to propose legislation or push forward decisions with any semblance of legitimacy or consultation. The Sadrists currently hold six ministries among five ministers: Planning Minister Ali al-Shukri is also acting Finance Minister, while the Sadrists also hold the ministries of Housing and Construction (Muhammed al-Daraji), Municipal Affairs (Adel Reza), Labor and Social Affairs (Nasaar al-Rubai), and Antiquities and Tourism (Lawa Sumaysim). With the position of Agriculture Minister empty since the resignation of Iraqiyya’s Izz al-Din al-Dawla, and the Communications Ministry still in the hands of the deputy minister in an acting capacity, the Sadrists may be seeking to access further concessions from Maliki in the form of two contract-heavy ministries. At the same time, the threatened boycott allows the Sadrists to put significant distance between their movement and Maliki’s in the run-up to the provincial elections, adopting a populist tone that emphasizes Maliki’s failure to provide services and security. The move, like Maliki’s decision to postpone elections in Anbar and Ninewa, makes clear that the provincial elections will be fought with every tactic at key players’ disposal, with little regard for legal, constitutional, or democratic principles. Stephen Wicken and Ahmed Ali are Iraq Research Analysts at the Institute for the Study of War. Violent attacks have targeted at least 10 candidates for the upcoming provincial elections since the candidate lists were announcedin January. The attacks bear the hallmarks of al-Qaeda in Iraq (AQI), suggesting that the group is seeking to disrupt the electoral campaign and dissuade Sunni Arabs from political participation. Meanwhile, recently resigned Finance Minister Rafi al-Issawi defied an arrest warrant by appearing at an Anbar protest, demonstrating his determination to continue his vocal criticism of Prime Minister Nouri al-Maliki. Iraqi Kurd ministers boycotted the cabinet meeting to protest the recent passage of the budget and they continue to examine their options with Baghdad. Iraq’s Independent High Electoral Commission (IHEC) announced on January 4 that 8,275 candidates had been registered for the provincial elections scheduled for April 20. Since then, there have been at least 10 attacks on candidates, primarily in predominantly Sunni areas of northern and western Iraq. 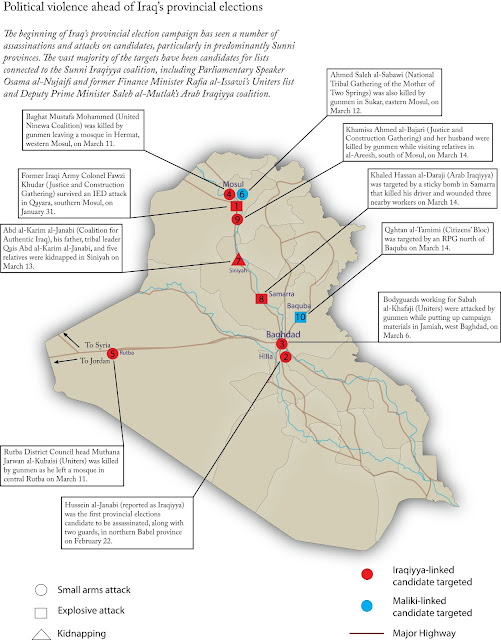 The majority of the victims have been candidates running on lists connected to the Sunni Iraqiyya coalition that contested the 2010 parliamentary elections. They have included candidates of Parliamentary Speaker Osama al-Nujaifi and former Finance Minister Rafi al-Issawi’s Uniters list; Deputy Prime Minister Saleh al-Mutlak’s Arab Iraqiyya list; the United Ninewa Coalition, led by prominent Ninewa tribal leader Abdullah al-Yawar; and the Justice and Construction Gathering, led by Dildar Zeibari who, like Yawar, ran on Ninewa Governor Atheel al-Nujaifi’s al-Hadbaa list in 2009. There have also been attacks on candidates belonging to the National Tribal Gathering of the Mother of Two Springs, a pro-Maliki party in Ninewa, and the Islamic Supreme Council of Iraq’s (ISCI) Citizens’ Bloc. 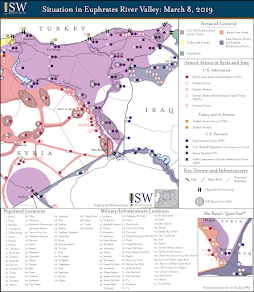 Although it is possible that some of the attacks may be the result of local or political rivalries, many of the attacks bear the hallmarks of Al-Qaeda in Iraq (AQI). Historically it has opposed Sunni Arab participation in the political process. Seen in the context of the ongoing anti-government protests in predominantly Sunni areas of Iraq, the attacks may demonstrate renewed attempts on the part of AQI and other militant groups to disrupt the electoral process. Meanwhile, on March 14, various reports indicate that about five suicide bombers attacked the Ministry of Justice (MoJ) and the nearby Foreign Ministry and Communications Institute in central Baghdad, killing 26 and wounding 63 including the attackers. Three suicide car bombs reportedly targeted the MoJ, and two suicide bombers dressed as security forces subsequently entered the ministry before being killed by the responding security forces or blowing themselves up inside the building. Baghdad Operations Command reported that responding Iraqi Security Forces (ISF) cordoned off the area and secured the building. Several MoJ employees reported a confused and disorganized response by the ISF. Maliki is reported to have visited the MoJ after the attack. In response, Iraqi politicians from across the spectrum condemned the attack while calling on the government to improve security measures and intelligence collection efforts. No groups have claimed responsibility for the attack, but the nature of the attack indicates a possible AQI operation. AQI likely launched the attack to manifest operational capability and send a message that it can still target fortified establishments. These spectacular attacks also seek to undermine the confidence of the Iraqis in their government’s ability to provide security. It remains to be seen if the MoJ was targeted due to its supervisory role of Iraqi prisons, where many AQI elements are held. Will the Shi‘a-Kurdish alliance survive? The budget vote in the parliament generated a quick reaction from the Iraqi Kurds, who protested the decision as an attempt to marginalize them and an attack on the principles of the political process. On March 9, Iraqi Kurdistan President Massoud Barzani invited the representatives of the Iraqi Kurdish parties in Baghdad for a meeting in Arbil and a statement was subsequently issued criticizing Prime Minister Maliki and his State of Law Coalition (SLC). The statement also called on the National Alliance – of which the SLC is a member – to take action against Maliki’s policies. Furthermore, the Iraqi Kurds boycotted the cabinet meeting on March 12, presumably to protest the passage of the budget. It is not clear whether the two major Iraqi Kurdish parties, the Kurdistan Democratic Party (KDP) and the Patriotic Union of Kurdistan (PUK), have a unified position on withdrawing from the cabinet and completely boycott the Baghdad government. Although the Iraqi Kurds were involved the discussions leading up to the vote, they remain surprised by the fact that their allies – the Iraqi Shi‘a parties – went ahead and voted on the budget without their presence. Overall, however, their response thus far has been measured. This can be attributed to the fact that their demands for oil company payments can be addressed through political agreements and executive decisions by Maliki. Additionally, toning down the anti-Maliki rhetoric may serve the Iraqi Kurds, depriving the premier of the opportunity to present himself as a defender of a unified Iraq confronting Iraqi Kurdish ambitions. Moving forward, the absence of President Jalal Talabani’s mediating role raises the possibility of increased tensions: both Maliki and the Iraqi Kurds will need a mediator if they are to ensure a continued Iraqi alliance between the Iraqi Shi’a and the Iraqi Kurds. Protesters in Baghdad, Anbar, Ninewa, Kirkuk, Salah ad-Din, and Diyala took to the streets under protests titled “Friday of Supporting Imam Abu Hanifa.” The name refers to the Abu Hanifa mosque in Baghdad’s Adhamiyah area where prayers were disallowed last Friday. During today’s prayers, the mosque’s imam condemned last Friday’s shutdown. It is important to note the reported participation of parliament speaker Osama al-Nujaifi at the protest, in addition to cooperative security forces. In Anbar, protesters likened Maliki to Bashar al-Assad and the situation in Iraq to that of Syria. Moreover, they called on the protesters to withdraw from the political process. Recently resigned Finance Minister Rafi al-Issawi, the subject of an apparent arrest attempton March 12, was in attendance despite a reported arrest warrant against him. Finally, protesters in Kirkuk’s Hawija demanded their local politicians withdraw from the government. It is evident that protesters are continuing to focus their efforts and energy on condemning Maliki and his policies. Simultaneously, they are seeking to place pressure on Iraqiyya politicians to withdraw from the government in the aftermath of the resignation of both Issawi and Agriculture Minister Izz al-Din al-Dawla. Iraqi Prime Minister Nouri al-Maliki has once more attempted to sideline recently resigned finance minister Rafia al-Issawi, one of Iraq’s most influential Sunni politicians and the premier’s most vocal critic. Issawi was the target of an apparent arrest attempton March 12 by Iraqi Security Forces. Maliki’s move to intimidate or arrest Issawi makes clear that the prime minister intends to continue targeting his political opponents – particularly prominent Sunni leaders – through use of the security apparatus. In an atmosphere of rising sectarian tension, such incidents are likely to play well with each side’s political constituency, reinforcing disaffected Sunni Arabs’ sense of victimization and intent to oppose Maliki while drawing support from Shi‘a Arabs who support Maliki’s aggressive line on those they deem as supporters of terrorism. The apparent arrest attempton March 12 occurred as Issawi was travelling to the funeral of Muthana Jarwan al-Kubaisi, who was the chairman of the district council of Rutba, a town in Anbar province near the Jordanian border. Kubaisi had been a candidate for the upcoming provincial elections running on Issawi’s list until he was assassinatednear Rutba on March 11. Issawi said that he was travelling to the funeral when his convoy was “intercepted” by a “heavily armed military force backed by helicopters.” It does not appear, however, that Issawi’s convoy was stopped, raising the likelihood that the move was intended to intimidate Issawi rather than detain him. Maliki likely used armed assets against Issawi while the parliamentarian was in Rutba in order to persuade him to flee Iraq. Such was the case when Vice President Tariq al-Hashemi, another prominent Maliki critic, was allowedto leave Iraq for the Kurdistan region in December 2011 despite the arrest of a number of his bodyguards. Hashemi was subsequently sentenced to death after being found guilty in absentia of organizing murders of political opponents and financing terrorism. Hashemi remains in exile in Turkey: he has kept up his criticism of Maliki, but his political party has been critically weakened in his absence. The claim by an “anonymous government source” that Issawi had sought to flee for Jordan may therefore have been intended to discredit Issawi. Since the arrests of members of Issawi’s protection detail in December, rumorshave circulated of arrest warrants issued for Issawi and Iraqiyya parliamentary leader Salman al-Jumaili on charges of inciting terrorism. Similar rumors have also appearedregarding former Awakening leader and Anbari strongman Ahmed Abu Risha, an ally of Issawi in the upcoming elections. A warrant against Anbari tribal leader Ali Hatem al-Suleiman, who has been extremely vocal in his criticism of Maliki since anti-government protests began, has also been reported; Ali Hatem has denied the existence of the warrant. Most prominently, in February, special forces attemptedto arrest Anbari protest spokesman Said al-Lafi, with whom Issawi has appeared in public, at a mosque in central Fallujah. The attempt was foiled when demonstrators helped Lafi to escapethe scene. The incident also comes at a time of rising political violence ahead of the upcoming elections. In addition to the murder of Muthana Jarwan al-Kubaisi, a member of the district council of Hit also in western Anbar was also assassinatedon March 11. Two electoral candidates in Ninewa were shot dead by unidentified gunmen in separateincidents in Mosul on March 11-12. The bodyguards of Iraqiyya candidate for Baghdad Sabah al-Khafaji were attackedby unidentified gunmen in western Baghdad while hanging election posters on March 6, while Hussein al-Janabi, an Iraqiyya candidate in Babel, was assassinatedalong with two of his guards in the north of the province on February 22. While these assassinations are likely related to local political rivalries, the increase in political violence will only heighten tension ahead of the voting. Deputy Prime Minister Saleh al-Mutlak calledthe arrest attempt “cowardly” and praised “the positions of the Anbar tribes that have accompanied Issawi.” There has not as yet been any indication that Anbari tribes were involved in preventing Issawi’s arrest as they were in protecteing Said al-Lafi. Mutlak’s statement, therefore, likely was intended to curry favor with the Anbaris who chasedhim from a demonstration in Ramadi in late December because of his continued involvement in the Maliki government. Although Mutlak was reported to have resigned on January 28 in protest at the government’s failure to meet protesters’ demands, he has continued to play an active role, particularly within Deputy Prime Minister Hussein al-Shahristani’s committee tasked with responding to the protesters, the concessions made by which Mutlak has defended. However, while apparently playing a role in helping Maliki to ensure quorum in order to pass the 2013 federal budget, Mutlak was forced to state his “anger and indignation” at the killingof anti-government protesters in Mosul on March 8 in order to have a hope of retaining some credibility with Sunni Arabs. Given the claims that Issawi was attempting to flee to Jordan and the rumors of an outstanding arrest warrant, Issawi is likely to remain in Anbar, surrounded by his tribesmen and supporters. The latest development diminishes significantly the likelihood that Issawi will seek to return to parliament in order to benefit from parliamentary immunity from prosecution, as Maliki’s State of Law Coalition predictedhe would do following his resignation from the finance ministry. Instead, he is likely to intensify his criticism of Maliki from his home province, amplifying his denunciations as the provincial elections approach. Should Maliki send forces to Ramadi or Fallujah, where Issawi’s support is strongest, in order to attempt to arrest him, the prospects of armed clashes are extremely high. Such confrontations would almost certainly escalate Iraq’s ongoing crisis, with grave implications for Iraq’s security and stability at a time when violence from Syria has begunto spill over the border into Anbar. Escalation in cross-border violence this week is the most serious since the Syrian uprising began two years ago, and in particular the ambush of Syrian soldiers returning after seeking refuge in Iraq further threatens to accentuate tensions between the Iraqi government and anti-Assad forces. In domestic politics, the recent budget vote in the face of a boycott by most other political parties has demonstrated the willingness of the National Alliance to use its parliamentary majority to work without the input of other parties. Prime Minister Nouri al-Maliki continues to favor a going-it-alone strategy, with the establishment of a new military command without consulting local leaders in Anbar, Ninewa, or the Kurdistan Regional Government (KRG). A series of incidents along the border between Iraq and Syria this week heightened concerns that the Syrian conflict may be bleeding into Iraq. 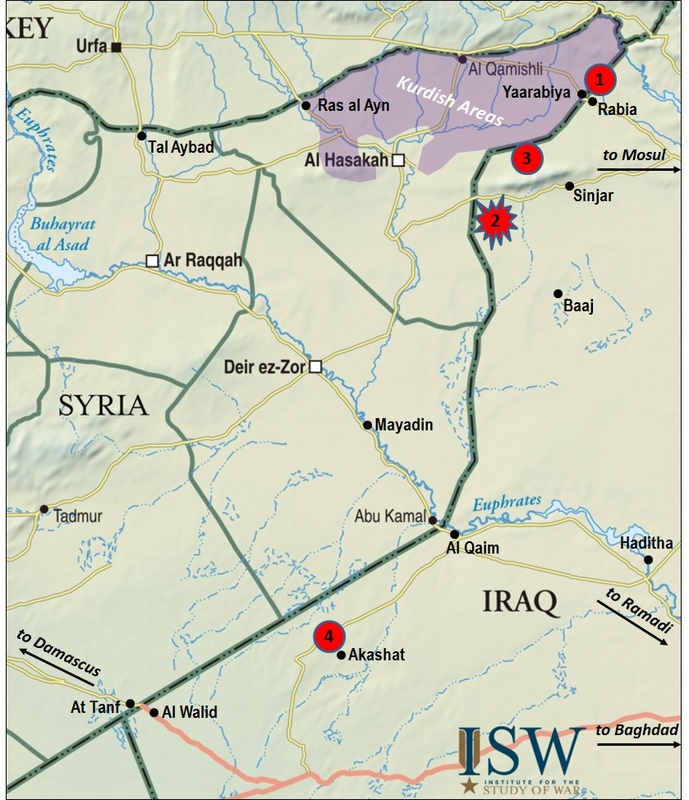 On February 28, four mortar shells fired from Syrian territory landed on the Iraqi side of the Yaarabiya-Rabia border crossing in Ninewa province [Map Point 1]. They were followed on March 1 by a Scud missile, also fired from Syria, which landed near the village of Yos Tapa [Map Point 2]. Then, following three days of fighting with Syrian regime forces, Syrian rebels seized control of half of the border town of Yaarabiya on March 2. Iraqi forces fired warning shots to prevent the fighting from reaching the border post, but residents of Rabia reportedly were forced to flee after shells landed on the Iraqi side of the border. On March 5, Syrian rebels were reported to have looted Yaarabiya, requesting that Iraqi forces not enter the area. A source at Sinjar hospital subsequently stated that six Iraqi soldiers had been killed during clashes with Syrian rebels along the border between Rabia and Baaj [Map Point 3]. The Iraqi government ordered the army to close the Rabia border post on March 3 “because of the Syrian government’s lack of control over the other side of the post.” By this point, however, a number of Syrian regime soldiers had fled into Iraq to escape the fighting at Yaarabiya. According to the Iraqi government, the soldiers had been transferred to Baghdad for medical treatment and were being escorted to the Al Walid-At Tanf border crossing in Anbar province when they were ambushed at Akashat [Map Point 4]. 48 Syrians and 9 Iraqis were reported killed. 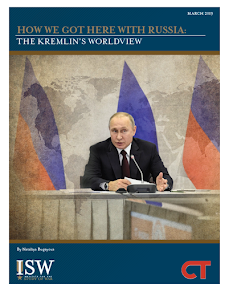 The escalation in cross-border violence is the most serious since the Syrian uprising began two years ago. Since the uprising’s beginning, segments of the Iraqi public -- particularly its Shi’a majority -- and officials have expressed fears about a post-Assad Syria including the possibility that it could renew an Iraqi civil war. The week’s events, coupled with anti-Iraqi government statements from FSA commanders, will further accentuate tensions between the Iraqi government and anti-Assad forces. The Iraqi parliament voted on March 7 to pass the 2013 federal budget law after five months of failed attempts. 168 MPs were present at the vote, just passing the quorum level of 163. The vote was boycotted by members of the Kurdistan Alliance and half of Iraqiyya’s MPs, but passed with support for Maliki’s State of Law Coalition from the Sadrists. The 17 percent allocation of the federal budget to the KRG was retained, but with a number of conditions that in practice will lessen this allocation considerably. Reports indicate that the Kurds did comparatively well out of the vote in some senses: a motion to decrease the KRG’s allocation to 13 percent was defeated, and the budget makes provisions for payments in advance to the Kurdish Peshmerga Ministry. However, Kurdish demands for an additional $3.5 billion for payments to oil companies working in the Kurdistan region were rejected, with the vote restricting these payments to $645 million. The Kurdistan Alliance’s immediate responses were to threaten an appeal to the Federal Supreme Court (FSC) and to cease oil exports. With Maliki ally Medhat al-Mahmoud returned to his position at the head of the FSC, an appeal is unlikely to benefit the Kurds. A refusal to export oil via Baghdad, moreover, will almost certainly prompt the federal government to refuse to make the payments earmarked for oil companies working in the Kurdistan region. Companies working in Kurdistan already will be aware of the legal and economic ambiguities surrounding the issue; the hardening of the Baghdad-Erbil dispute, however, may cause some companies to reconsider their positions in the long term. The vote provides further evidence of recent developments with serious implications for Iraqi politics. Firstly, Iraqiyya once more demonstrated its internal divisions over the budget vote, with Deputy Prime Minister Saleh al-Mutlak reportedly leading a group of Iraqiyya MPs into parliament to ensure quorum for the vote. Mutlak’s pro-Maliki stance was so evident that even Sadrist MP Awad al-Awadi commented publicly, noting that Maliki was using Mutlak to “dissolve” Iraqiyya. Iraqiyya MP Jaber al-Jaberi, who boycotted the budget vote, argued meanwhile that voting without the Kurds meant that parliament had “laid the foundation stone in the project of dividing Iraq”. Given Mutlak’s previous inconsistencies regarding accommodation with Maliki, and given that Parliamentary Speaker Osama al-Nujaifi does not appear to have intervened to prevent the budget from being passed despite his high-profile opposition to Maliki, Iraqiyya’s stance on the budget remains somewhat unclear. Nujaifi may have allowed the budget vote to come to the floor knowing that a defeat for the Kurds would play well with his Sunni Arab base in Ninewa. The Sadrist’s support for the budget law, moreover, confirms their willingness to side with Maliki, particularly against the Kurds, whose demands they have opposed as inflated and “unjust.” The Sadrists in recent weeks have abandoned the pretense of supporting anti-government protests in predominantly Sunni areas; accepted acting control of the Finance Ministry at Maliki’s request; and made a deal with the premier over control of the Accountability and Justice Commission. Although the Sadrists continue to position themselves to compete with Maliki at the provincial level, they appear increasingly reliable as members of the Shi’a National Alliance at the national level. Evidently highlighting this trend, State of Law Coalition MP Abd al-Salam al-Maliki stated on March 8 that the experience of passing the budget law in the face of Kurdish and Iraqiyya opposition had only encouraged the National Alliance to work as a parliamentary majority in the future as a precursor to forming a majority government. Such a development threatens to shut Sunni Arabs and Kurds not willing to work with the Maliki government out of government entirely, with serious implications for their continued willingness to engage in the political process. Anti-government protesters staged “Last Chance Friday” on March 8, with large protests in Fallujah, Ramadi, and Mosul, and smaller protests in Samarra, Baiji, Tikrit, and Dur. Isolated protests also took place in the Baghdad neighborhoods of Athamiyah and Ghazaliyah. Violence returned to the Mosul protests for the first time since early January, when security forces fired on and wounded four demonstrators in the center of the city. On March 8, one of the Mosul protest organizers, Hussein al-Obeid al-Jubouri, was arrested, reportedly by federal police, on charges of belonging to the insurgent group Jaysh Rijal al-Tariqa al-Naqshbandia (JRTN). In response to the arrest, demonstrators were reported to have thrown stones at police units in central Mosul. The police responded by opening fire on the protesters, killing three demonstrators and injuring four. Federal police commander Mahdi al-Gharawi subsequently insisted that local anti-riot police, and not federal police, had opened fire. Seeking to prevent further clashes, security forces quickly imposed a curfew on eastern Mosul. The shootings were immediately condemned by senior politicians from Ninewa province, particularly Speaker Nujaifi, who immediately announced the formation of a parliamentary committee to investigate the killings. At the same press conference, Izz al-Din al-Dawla, a member of Nujaifi’s Iraqiyoun party within the Iraqiyya coalition, announced his resignation as Agriculture Minister in protest at the shooting, saying that “those who had sent him to Baghdad were today shedding blood.” Dawla lashed out at the Maliki government, criticizing it for failing to meet protesters’ demands. Dawla’s resignation leaves Iraqiyya with control of only four ministries, and further emphasizes the internal divisions within the bloc. Increasingly, Iraqiyya appears split between a faction led by Saleh al-Mutlak and including Jamal al-Karbouli’s al-Hal party, which favors collaboration with Maliki; and a faction led by recently resigned Finance Minister Rafia al-Issawi and supported by Speaker Nujaifi, which opposes participation in government. Two of the remaining ministers – Education Minister Mohammed al-Tamim of Mutlak’s Hiwar party and Industry Minister Ahmed al-Karbouli of al-Hal – belong to the faction closer to Maliki, while Science and Technology Minister Abd al-Karim al-Samarrai of Vice President Tariq al-Hashemi’s Tajdeed party is thought to oppose cabinet participation, and Minister of State for Provincial Affairs and Acting Communications Minister Turhan Mufti’s National Turkmen Front is allied with Nujaifi and Issawi for the upcoming provincial elections. Should the demands of anti-government protesters grow in response to the latest confrontation, Iraqiyya will be placed in an even more difficult situation. As with Issawi’s resignation last week, moreover, an open cabinet position grants Maliki with yet another opportunity to install an ally and move closer to majority government. In developments reminiscent of the establishment of the Tigris Operations Command in July 2012, Maliki’s decision to set up a new operations command to encompass Anbar and Ninewa provinces has raised tensions in the area. The formation of the Al-Jazeera and Al-Badia Operations Command (JBOC) first came to light after the Ministry of Defense announced it had carried out an operation on February 16, 2013 in the Syria-adjacent al-Qaim area in Anbar province. The JBOC is reportedly commanded by General Hassan Karim Khdheir, who had previously headed the Ninewa Operations Command. Iraqi officials and press reports indicate that the JBOC will be tasked with securing and protecting the Iraqi-Syrian and Iraqi-Jordanian borders encompassing both provinces. The JBOC becomes the tenth operations command established by Prime Minister Maliki. The formation of the JBOC has been met with strong opposition by local Ninewa and Anbar officials, who described the step as “illegal,” and by the KRG, with all pointing out that it was formed without their consultation. On March 5, a JBOC contingent attempted to deploy to Sinjar district in western Ninewa and establish a headquarters, but were blocked by Kurdish Peshmerga forces. KRG officials viewed the move as a violation of agreements between Baghdad and Erbil on security forces deployments in areas with disputed internal boundaries. The following day witnessed a demonstration by locals rejecting the opening of a JBOC headquarters in the area. The JBOC forces subsequently withdrew, but reports indicate that on March 7 they blocked a road that connects Sinjar with Dohuk in Iraqi Kurdistan. The presence of the JBOC may be the result of Maliki’s apprehension that the current security forces in Anbar and Ninewa are not able to adequately protect the border. This has recently become a bigger concern as the violence in Syria has extended into Iraq. Furthermore, the appointment of General Khdheir indicates Maliki’s desire to entrust security responsibilities with commanders known to him. Khdheir’s appointment may have a political dimension as well, given his past contentious relations with the Iraqi Kurds. Past tensions between the KRG security forces and the current public discontent in Anbar and Ninewa suggest that the JBOC’s role will likely continue to cause controversy as the provincial elections approach.